The real aftermath here is the bad aftertaste James Kent’s new adaptation leaves with the viewer. He delivers an ending that I found personally offensive, highly debatable, and utterly misogynistic. The Aftermath, based on the novel by Rhidian Brook, seems to suggest that both of the film’s male decision makers have a narrow view of women’s emotions. 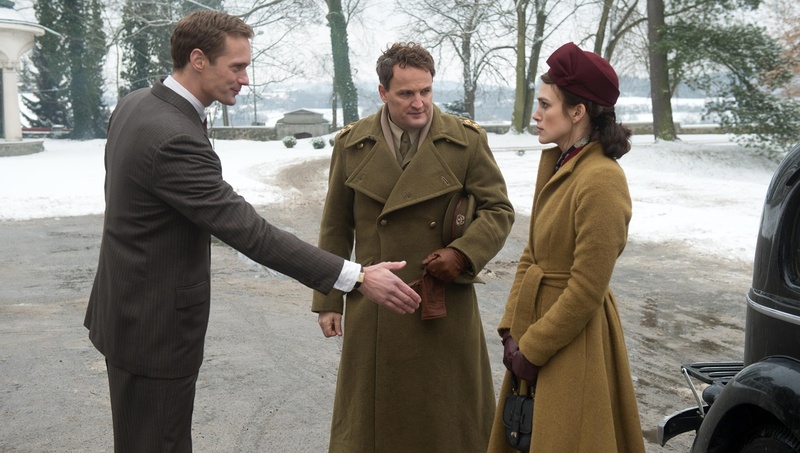 It’s purposely old fashioned, the kind of film Oscar-nominated Kiera Knightley (“Atonement”) has built her career on. “Aftermath” is the kind of story Colette (the feminist character Knightley played last year) would have spoken out against. The drama from this page turner is almost comical; a forbidden romance set in a post-war Germany, with suicidal Nazi sympathizers lurking around every corner. It’s the type of film that if you’re not on board from the beginning, because you like this sort of thing, there is little in the film that will get you there. Colonel Lewis Morgan (Clarke) has been overseeing the British occupation of Hamburg in 1945, following the end of the war. Destruction is around every corner as the city lies mostly in ruins. British officers like Morgan are housed in the homes of wealthy German. Rachael (Knightley), his wife, arrives from London unimpressed with the grand house they are to live in. The owner, and current occupant, Stephen Lubert (Skarsgård) is allowed to remain in the mansion but is forced to move into the attic with his teenage daughter (Thiemann). Unhappy since the death of their son, Rachael feels neglected by her duty-bound husband and eventually finds comfort in the arms of Lubert, a man she is supposed to despise as “the enemy.” Given a chance to start again, she must choose between the past and the future. "The Aftermath" sustains our attention purely out of guilty pleasure. While the quartering of officers in the homes of their conquered enemy is a common wartime practice since ancient times, the idea of British soldiers kicking out a family of non-Nazi sympathizers who also suffered great personal loss due to the war, is the type of scenario romance novels thrive on. Every move each character makes is so obviously an attempt by the author to inject drama into every corner that it feels as if the author was working his way down a checklist. Stereotypes run rampant; from the stuck up, judgmental British aristocrat, to the good looking mysterious German. “The Aftermath” only scratches the surface of the differences in culture before diving into the triangle romance. This story also never explains what the film “Labyrinth of Lies“ did so well, that most Germans right after the war were unaware of the full depth of the Nazi atrocities. One scene has Lubert presumably seeing a photograph of the concentration camps for the first time, but doesn’t take time to explore that further. “The Aftermath” sustains our attention purely out of guilty pleasure. We want to see how Clarke’s character will react when he discovers his wife’s adultery. The story is crafted in a way that cause some to want see Clarke to suffer for abandoning his wife when she needed him the most. The man throws things to show he is angry, the woman cries to show she is sad, and cheats on her husband because she is in a passionless marriage. This story feels so outdated and unable or unwilling to find a message that might prove otherwise. The actors are well cast, though none of them offer anything more or less than in previous, similar performances. Storybook framed shots including stunning exteriors of the mansion, snow covered romantic walks and birds eye views of the cities wreckage make the cinematography one of the films most impressive elements. The Aftermath is a bit too old fashioned in it’s ideas of romance and female perspectives.